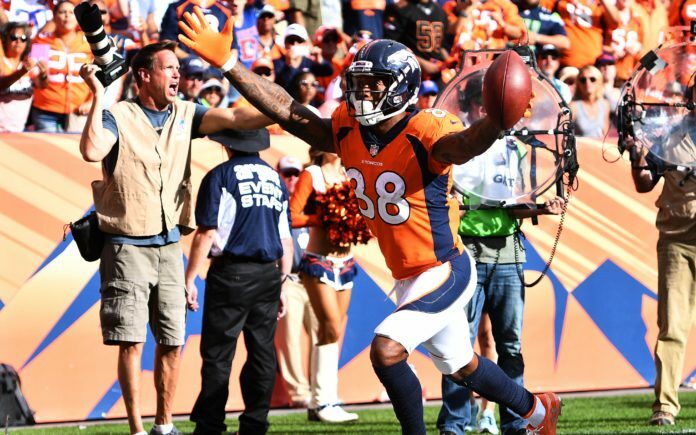 Demaryius Thomas celebrates a TD. Credit: Ron Chenoy, USA TODAY Sports. The NFL’s Oct. 30 trade deadline is less than a week away. That means teams all over the league are looking to stock up on talent for a Super Bowl run, while others look to sell off any valuable assets for draft picks to help rebuild. 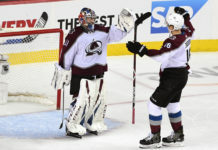 If Thomas were to be traded, who are some of the potential partners? Which teams might be a fit for a 30-year-old wideout whose $12 million cap hit vaults to $17-plus million in 2019? Miami Dolphins: One landing spot that could make sense is down in South Beach. The Dolphins are the surprise team in the league so far, with Brock Osweiler is balling out, and they should compete for a wild card spot come January. Not only is Miami in win-now mode, but they have a great need at receiver as well. The Dolphins were already lacking depth at wide receiver as they entered the season with Kenny Stills, Albert Wilson and Danny Amendola starting for them. Amendola has been a reliable slot receiver for the ‘Phins, but they need help on the perimeter. Stills has had an atrocious season that’s earned him a receiving grade of 63, ranked 182nd among qualified players by Pro Football Focus. For comparison, Bills’ fullback Patrick Dimarco holds a grade of 68.5, ranked 118th. On the other side, Wilson has been Miami’s highest-graded receiver with a grade of 82.6, good for 28th in the league. 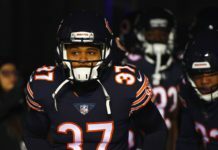 However, on Sunday, Wilson suffered a hip injury that his agent Drew Rosenhaus called “significant.” Rosenhaus went on to say that, “The best-case scenario is he would miss a few weeks,” and Miami worries he may be gone for the season. Not only could a receiver like Demaryius Thomas help alleviate some of the stress put on the Dolphins’ offense by Wilson’s absence, but he could replace Stills in the rotation if Wilson were to come back healthy. Plus, Thomas already has a relationship with Dolphins’ head coach, Adam Gase and quarterback Osweiler. Gase was with the Broncos as offensive coordinator from 2009-2014 and Osweiler was with the Broncos from 2012-2015 and again last season. Philadelphia Eagles: Another team that makes sense as a potential landing spot for Thomas would be the World Champion Eagles. 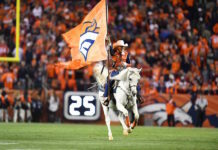 It was already reported by CBS’ Jason La Canfora that the Eagles had contacted the Broncos and inquired about cornerbacks Bradley Roby and Chris Harris Jr. as well as wide receivers Thomas and Emmanuel Sanders. Like the Dolphins, the Eagles could certainly use some help on the perimeter. Alshon Jeffery is the only Philadelphia wide-receiver graded among the top 180 receiving threats in the league, and even he isn’t listed in the top 50. In fact, of the Eagles’ five highest graded receiving weapons, Alshon is the only one who plays on the outside. This, along with a less than potent run game is a large part of the reason why Wentz now ranks 14th among qualified quarterbacks according to PFF. The Eagles are an organization that likes to push all their chips to the center of the table. With their Super Bowl window wide open and a lack of weapons to help Wentz, now might just be the perfect time for them to do so. Others: Another bunch of teams that would make sense would be the Cleveland Browns, New York Jets, Buffalo Bills, and Arizona Cardinals. Due to the Eagles win in the Super Bowl last year and the Rams dominating the league this year, a new team-building strategy has cropped up. While your quarterback is on his rookie contract, surround him with a bevy talent and chase a Super Bowl before you have to pay him. The aforementioned Browns, Jets, Bills, and Cardinals fit this mold perfectly. All have young quarterbacks that could use a better supporting cast and all three will have plenty of cap space to use. Teams like the Colts and 49ers who have already paid their quarterbacks will be looking for additional weapons too. However, the problem with so many teams bidding on weapons for their young quarterbacks is that there won’t be enough to go around. This will lead to a bidding war that could make Thomas’ $17 million dollar cap hit in 2019 look like a bargain. Remember, the Chiefs signed Sammy Watkins, whose career is far less impressive than Thomas’, for $16 million annually this past March. That was also during a free agency period where the Bears were the only team trying to surround their second-year quarterback with talent. If the Broncos do choose to move on from Thomas, there’s a good chance he’ll be catching passes from a rookie quarterback.